We’ve been a staple in Seattle for nearly 45 years. We love this city. Furthermore, we believe it is our duty to give back to the community. This is the page where we post about all the times we’ve been lucky enough to do just that. Additionally, to highlight the wonderful organizations we work with! Please take a moment to read through and learn more about these organizations and the work they are doing for our city. Below are the current organizations we work with and/or sponsor. If you are a non-profit or other community outreach program interested in forming a partnership with Bedrooms & More, or if you are an organization looking for sponsorship or donations, please contact us, contact@bedroomsandmore.com. 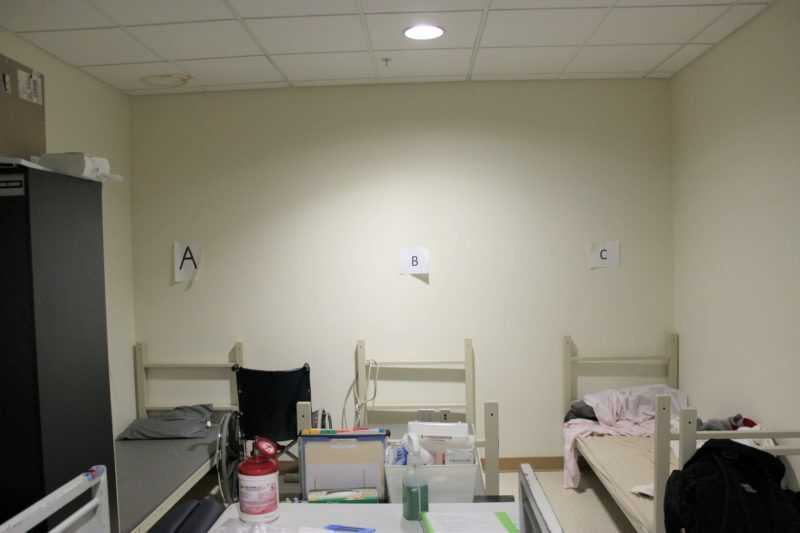 This summer, the International Interior Design Association’s Northern Pacific Chapter undertook their annual charitable project: Redesigningthe recovery room for Mary’s Place in downtown Seattle. IIDA reached out to local businesses for donations, and we were so pleased for the opportunity to help! 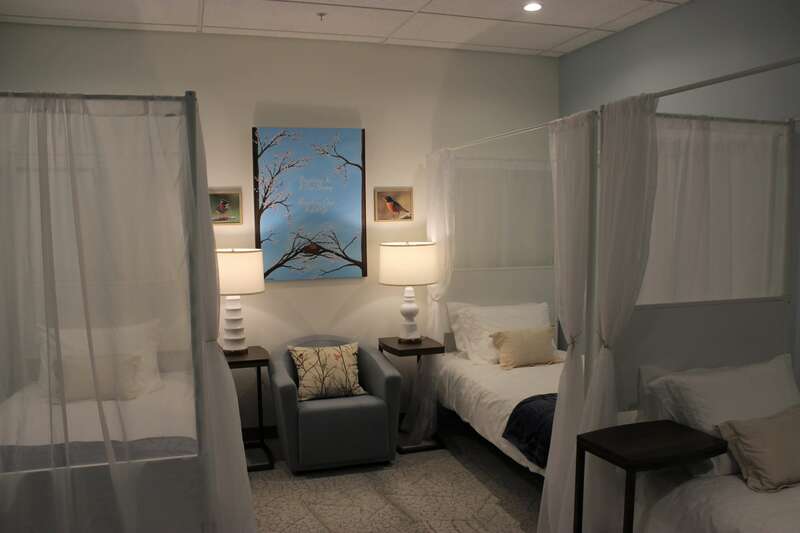 Bedrooms & More donated the mattresses, bedding, and a few decorative pieces to the project. IIDA and their volunteers did an incredible job of transforming the space. We couldn’t be happier with what they were able to accomplish; we’re sure they are, too! We look forward to working with them to make future projects like this one a reality. After countless hours of hard work by volunteers! Mary’s Place is a Seattle staple. Dedicated to helping families dealing with the ever-growing crisis of homelessness, they are working to make our city a better, healthier, happier place for everyone. Mary’s Place is seeing exponential growth as our community comes together to help support their incredible vision. We feel lucky to have a partnership with their organization, whereby we donate much-needed bedding items including to their new shelters. Learn more about Mary’s Place and ways you can help change a family’s life forever. Spring Back Recycling boasts multiple locations across the U.S. We work with their Tacoma plant, where they break down thousands of pounds of mattress materials each year and recycle them. Because rather than letting these materials end up in our landfills, the components can be recycled. Spring Back employs formerly incarcerated men. Thereby, providing jobs for those who might otherwise struggle to find them. When we deliver a mattress to a customer, we often take away their existing mattress. If that mattress can be donated, we usually find it a new home. If not, it usually makes its way down to Spring Back. Learn more about their mission and find a location near you by visiting their website. 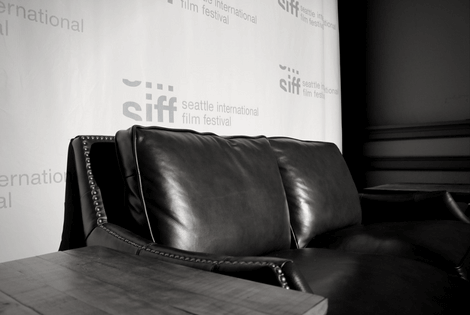 We reached out to the Seattle International Film Festival earlier this year to pursue a sponsorship with their organization. Why? Because they’re dedicated to bringing the best filmmakers, the best films to Seattle. Such a culturally significant organization is something we love to support. If you don’t know already, Seattle is pretty proud of this annual film festival, and the organization’s historic locations that screen films year round. Check out their website to learn more about the annual festival, their year-round locations, and how you can sponsor and/or volunteer for their organization. For the second year in a row, Bedrooms & More is proud to sponsor Toxic Free Future’s annual fundraising event. A non-profit organization dedicated to removing toxic chemicals from the products we use every day, Toxic Free Future works hard to bring about change in our legislation to remove harmful chemicals from our environment. The Wallingford Family Parade takes place every summer along 45th Street in Wallingford, Seattle. The parade is run by the Wallingford Chamber of Commerce. For the past three years, Bedrooms & More has been the main sponsor of the event. Furthermore, we can’t express how grateful we are for the opportunity to support our neighborhood. It’s great to see the Wallingford community come out in full force to celebrate the businesses and people who make our neighborhood a great place to live, work, and play. Learn more about the parade and other events in the Wallingford area here. Did you spot us at the parade these past few years? Our floats are definitely a sight to see! 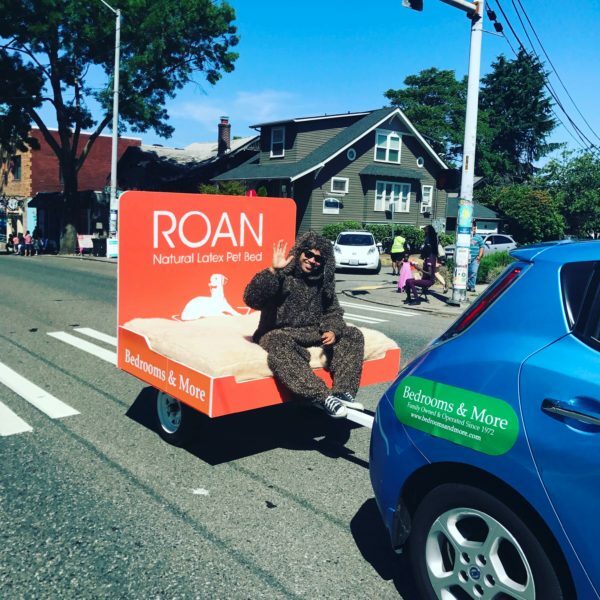 To honor this one theme, “The Dog Days of Summer”, our own Chamroeun Pen donned a very stylish dog costume and waved to crowds atop our homemade pet bed float! Additionally, did you know Bedrooms & More now sells luxury pet beds for your furry loved one? Made from washable wool and botanical latex, your four-legged family members are sure to fall in love, then fall blissfully to sleep.